Home » Alcoholics Anonymous » Big Book » Bill W » Spirituality of Imperfection » Twelve-Step Program » The Spirituality of Imperfection:A.A. taps into an ancient source of spiritual awareness, making available to modern men and women the long and rich tradition of the spirituality of imperfection. 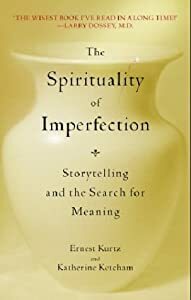 The Spirituality of Imperfection:A.A. taps into an ancient source of spiritual awareness, making available to modern men and women the long and rich tradition of the spirituality of imperfection. Title: The Spirituality of Imperfection:A.A. taps into an ancient source of spiritual awareness, making available to modern men and women the long and rich tradition of the spirituality of imperfection. The 12 Step program of recovery, when I thought about the steps and the program, meant one thing to me, and one thing only: I had to change. There was a remedy for my alcoholism and that was growth. My acceptance was all about acknowledging that and embracing the willingness to do the work. It’s like Bob Dylan put it, “he not busy being born is busy dying,” in his song, It’s Alright, Ma (I’m Only Bleeding). I needed to be reborn as a sober individual and AA understood that. So, you might ask, what does this have to do with The Spirituality of Imperfection? First, these are the kind of thoughts you are likely to have reading this post. The pilgrimage image suggests that the goal of this particular journey known as life is not to prove that we are perfect but to find some happiness, some joyful peace of mind in the reality of our own imperfection. The Spirituality of Imperfection is subtitled Storytelling and the Search for Meaning. The telling of these stories is at the core of the standard format of AA open meetings, of course. And it’s the core of the AA “pilgrimage.” It’s the equivalent of a Google map from A (drunkenness) to B (a life of sobriety) by virtue of a small dose of honesty and an openness to change. As a result of these stories, the AA member is reminded again and again of the path, of the need to remap and reorient, and she or he is provided with examples of how others have managed to do exactly that. A.A. taps into an ancient source of spiritual awareness, making available to modern men and women the long and rich tradition of the spirituality of imperfection.In the second part, how this spirituality is manifested in AA is explored. And finally, in the last section, key qualities of the spirituality of imperfection are explored. Some of these will not be unfamiliar to those who have spent time in the rooms of AA: gratitude, humility, tolerance and forgiveness. As is often said, AA is a spiritual program, not a religious one. There are no dogmas or absolutes. In AA “there are no absolutes but one: ‘I am not absolute,’” the authors write, quoting Bill W.
Unlike religion, spirituality embraces the question and values the person who asks the question. And the spirituality of imperfection is not about the destination; it is about the path, the direction. Of course he was pointing in the wrong direction. The spirituality of imperfection begins with the recognition that trying to be perfect is the most tragic human mistake. The problem with organized religions, Bill Wilson once complained, 'is their claim how confoundedly right all of them are. You will never find one iota of support or suggestion in the Big Book for multiple fourth and fifth steps. Not a hint. AA The Spiritual Kindergarten: Bill Wilson's attitude about spirituality is as refreshing today as it was back in the 30's.